Spoiler Note: The review reveals the name of a couple of high profile actors who make cameo appearances. I think these are supposed to be surprises, although they’re inconsequential. Nevertheless, if you don’t want to know, don’t read past the fourth paragraph. Action comedies are among the easiest films to make but the hardest ones to make well. To succeed, they must not only contain enough laughs to tickle the funny bone but sufficient effective action to keep the pulse elevated. Central Intelligence fulfills neither of those criteria. With its canned, predictable action sequences and mirthless attempts at humor, it displays an ineptitude that is frankly shocking considering the talent involved. On paper, it sounds like a workable idea: a buddy movie featuring Dwayne “The Rock” Johnson and Kevin Hart - two of the biggest stars in the action (Johnson) and comedy (Hart) arenas. A modern-day reworking of the Twins concept, the problems start with the writing and end with the execution. It’s hard to imagine a worse script. 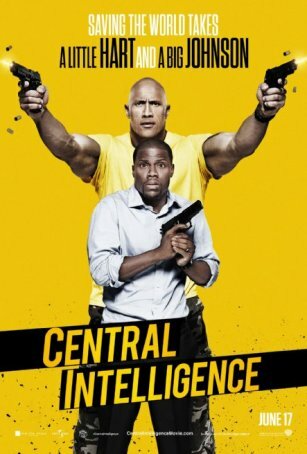 Central Intelligence isn’t just hampered by a moronic storyline (suspension of disbelief be damned) but even Kevin Hart can’t make the dialogue funny. I laughed once - during the end credits when an outtake breaks the fourth wall. All the best bits are in the trailer, and it’s a terrible trailer. The movie begins “20 years ago” with lead characters Bob Stone (Johnson) and Calvin Joyner (Kevin Hart) in high school. Bob’s a fat nerd who represents prime pickings for a group of bullies. The only one to come to his defense is the ultra-popular, “most likely to succeed” Calvin. Cut to the present - Calvin, married to his high school sweetheart, Maggie (Danielle Nicolet), is slaving away in a dead-end job. On the eve of the high school reunion, Bob - now a buff muscle-man - looks him up. The two go out for a drink and, when a bar brawl erupts, Bob shows Calvin his new moves. Turns out, however, that Bob isn’t just a nice guy looking to reminisce - he’s either a rogue CIA agent out to make a killing by selling dangerous secrets or a squeaky clean operative who has been framed. (Can you guess which one he is??) Agent Pamela Harris (Amy Ryan) doesn’t seem to care whether Bob is innocent or guilty - she just wants to catch him and she’ll use Calvin to get her way. This sets up a lot of running around that culminates, as expected, at the reunion. Twins got a lot of mileage out of the chemistry between mismatched “brothers” Arnold Schwarzenegger and Danny Devito. That movie’s story is forgettable - the only thing anyone remembers about it is the unlikely pairing. Central Intelligence’s attempt to mine the same vein of box office gold fails from the start when it’s evident that Johnson and Hart have all the interpersonal combustibility of two inert gases. They both seem like fish out of water. Hart, neutered by the demands of a PG-13 script, is uncharacteristically muzzled. Johnson, forced to act like a gargantuan teddy bear, is awkward throughout. The PG-13 is undoubtedly part of the problem. The movie is chock-full of bloodless violence. Perhaps 1000 rounds are fired from guns and maybe a half-dozen (max) find targets. What’s the point? Our knowledge that no one is going to be seriously injured (never mind killed) reduces the film’s “action” to routine filler. So we wait for the humor to kick in, which doesn’t happen. Even the inclusion of two “name” actors known for their comedy work (Jason Bateman and Melissa McCarthy) can’t provoke more than a grimace. To add insult to injury, the movie attempts to shoehorn an anti-bullying “message” into this mess. Like everything else in Central Intelligence, it belly-flops. Giving a movie bully his comeuppance coupled with a line about how bullying is bad is borderline-insulting. There’s also something vaguely offensive about having the object of high school bullying turn into The Rock. Would that all of us could be so lucky. Instead of avoiding this minefield, Central Intelligence foolishly tries to “address” it and the result is just another of many miscalculations. All of this adds up to one inescapable conclusion: Just because a movie uses the word “intelligence” doesn’t mean it has any.